Background: Had trouble with low pwm LEDs years ago, set up my workplace to not strain eyes - all good for 2 years now (on windows). Got a new 2018 15" MacBook Pro few weeks ago and eye strain / brain strain /general stress etc returned. The method: Connect the various Macs with one and the same external monitor (mine was BenQ bl3200 2560x1440) and compare one and the same BLURRED picture on it. I used the default high sierra background on the lock screen. Also side note: Difference was more visible irl + when taking pics of the screen with the phone - use a camera app with a manual focus ability - that way you can avoid contaminating the picture with moire noise from pixel array. Also a side note. Didn't have this kind of forum years ago when first hit with computer eyestrain. So really thankful for the founders of this for setting this up and everybody who shares their stories and ups and downs. Keep up the fighting! cont-temp Nice, so the 2013 macbook is fine both on its native display and on the external, and the 2018 is bad on both? How is it not dithering if the system is the same (sierra)? The intel graphics card driver? Which graphics is in the 2018 thats a problem and which is in the 2013 thats good? Could you share the exact specs of the 2013 macbook with also display manufacturer (can be discovered via terminal command you can find on google). Id like to find such model and try it for myself. martin So far tested the 15" 2013 only on the external monitor and it has only Intel Iris Pro (1536MB ) graphics - no extra gpu on board. 2018 is bad on both native and on external monitors - both with its Radeon Pro 555X and with Intel UHD Graphics 630. Both computers have the latest High-Sierra. Live update: snagged a 2014 13" machine from a passing colleague - It has Intel Iris graphics and by the looks of the test picture it might be fine also. 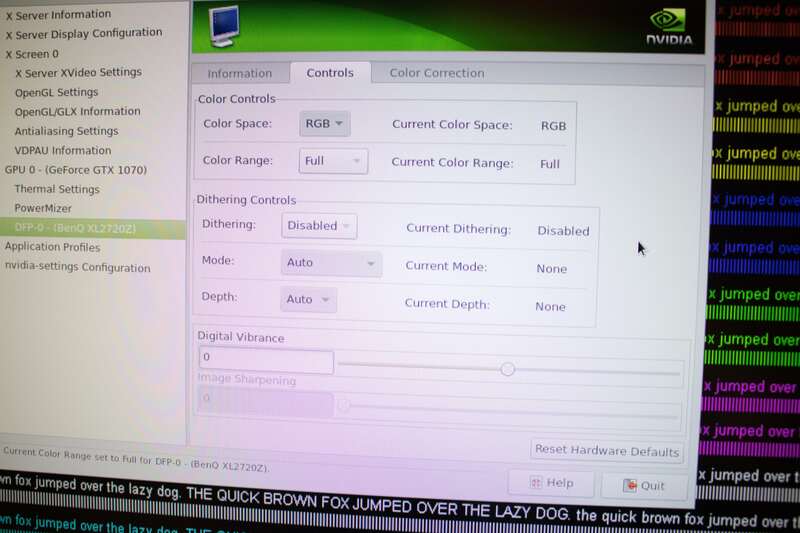 martin The dithering would be different with the different graphics card models. cont-temp On Macbooks with dedicated graphics the external display output always goes through the dedicated GPU. cont-temp What is the configuration of the 2013 macbook that doesnt hurt your eyes? Also, did you try it without external monitor? @cont-temp Can you explain what exactly you see that you are calling banding? I see no difference other than the bottom picture seems less washed out overall.he bottom one has the brighter orange spot bottom right but they are also not centered the same in the frame. JTL cont-temp On Macbooks with dedicated graphics the external display output always goes through the dedicated GPU. What does that mean for his results? hpst Here's a photoshopped picture of color banding - mind this is not something that is seen irl but compared to the agressive dithering smoothing its noticeable for sure. I tried to make the lines more visible - check this picture and then refer back to my original posting to try to see the banding there. Also it could depend on what type of monitor you yourself are using. Notice the topographic lines - like on a paper map of terrain. hpst What does that mean for his results? cont-temp Not trying to be obtuse but just making sure I understand....those wavy lines that look like a topographical map are what you are referring to right? I had assumed those were just the sort of moire pictures of displays often show due to the camera. I thought dithering banding would be more uniform for some reason I can't explain but now feels silly anyway since LCD's don't scan in some uniform way...interesting. Either way since we still cannot selectively shut it off universally and see I feel so stuck. If you could reliably turn it off and on on different hardware and OS (I only have access to linux so cannot even try other ones except in a shop) the way you can adjust fonts etc, it would be a quick test. Even people who use Windows and dithering.exe don't seem to be sure if it's even on or working. I need to look at the same images on my "good" vs "bad" devices and see if I notice banding...does it need to be blurry to really notice? hpst Look at this picture, zoom in and out, you can see the "lines" change despite being a static PNG file. hpst Yeah, I avoided the moire lines by using manual focus and slightly focusing beyond the monitor. That way no moire was present but visible color banding lines could be seen. Color banding is also static - you can see it with your own eyes - its not something that can only be captured with phone camera like LED PWM flickering for example. And I think the picture needs to be blurry - that way there would be more subtle color changes that monitor can't hardware-handle them so the banding occurs. JTL Sorry, don't know if you posted this as a good example or a bad - but this is moire effect. the topographic lines do not follow the flow of the colors on the screen. cont-temp That's exactly what I was pointing out, that your demonstration is different from the moire interference patterns we see. Could you please check what panel make you have on the mac? http://osxdaily.com/2011/10/30/how-to-check-for-an-lg-display-in-a-macbook-air-and-make-it-look-better/ LG or Samsung. Also could you confirm that you also have no issues using the non-dithering macbook without the external display? Assuming it's a Samsung. I'm not going to take it apart just to find the model number. martin I have LG panel on the 2018 MacBook Pro. I dont think I can test the 2013 Intel Iris one with external screen anytime soon, but I'll but it in my backlog. Right now my daily Mac is late 2010 with NVidia and this is all good for me with the integrated screen. Haven't tried any externals with it yet. JTL Wouldnt want you to do that with the only working mac🙂 The command changes depending on the OS unfortunately, can be googled for specific OS. Btw I want to ask you about your cannabis medicine, could I via chat or email? yesanton Hi, It was Late 2013 15" with Intel Iris Pro only, no added graphics. What panel of LCD I do not know yet. Will try to find out tomorrow.